We supervised a thesis this semester on the impact of central clearing on market liquidity for credit default swaps (CDS). In this post, we want to share the main results. The net effect of central clearing? As discussed in this post, central clearing counterparties (CCPs) can increase market liquidity because they reduce counterparty risk. Of course, there is a price for this: CCPs impose clearing fees, and require investors to post collateral. Dealers (who offer their clients access to the CCPs) are likely to pass on these costs via higher bid-ask spreads. Empirically, the net effect is unclear: are lower counterparty risk or higher order procecessing costs more important? 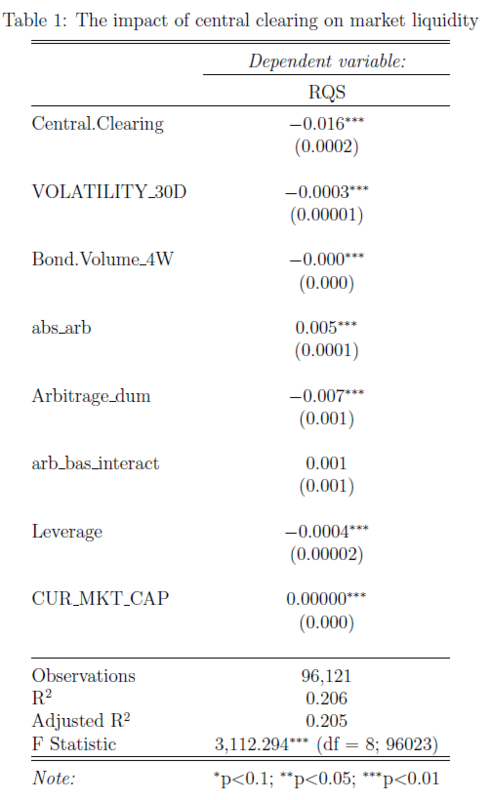 Hence the thesis: the student examined empirically the net effect of central clearing on CDS market liquidity. The empirical analysis was set up as a simple Ordinary Least Squares regression. There, the dependent variable is CDS liquidity. The student measured this via the bid-ask spread relative to the mid spread. The main explanatory variable is an indicator variable that switches from 0 to 1 when a CDS contract becomes eligible for central clearing. and the CDS-bond basis (to capture arbitrage opportunities between the two markets – recall our post on the trading motives in CDS markets). We display the regression results in Table 1. Consider a CDS contract with a 5% bid-ask spread, and a mid spread of 100 bps. This is in line with the 2017 spreads for Porsche and Daimler we discussed in this post. For this contract, you could buy protection at 102.5 bps (ask), and sell protection at 97.5 bps (bid). Central clearing would move the ask quote down to 101.7 bps, and the bid quote up to 98.3 bps. Doesn’t seem substantial? Well, if you consider the standard notional volume of 20 mn € and contract maturity of 5 years, it means that you save 8,000 € – on every single transaction. Other authors (Loon/Zhong 2016) obtain a similar magnitude using a different methodology. Overall, the thesis gives evidence for an improvement in liquidity via central clearing. An open question, which we will address in future posts, is which economic channel causes the increase in market liquidity.